The Louis Vuitton Trophy is a series of match race regattas in America's Cup Class yachts whose finals are held these days in Auckland. This event enjoys widespread TV coverage, but the racing is also be covered live on the Internet through live streaming and race coverage highlights plus 3-D interactive Virtual Eye tracking from the race course, along with expert commentary and analysis. In digging (about 200 meters deep) into the ice of West Antarctica (Ross Ice Shelf), to their utter surprise, NASA scientists found a shrimp-like creature (Lyssianasid amphipod) and also discovered a tentacle of jellyfish, in this polar desert. NASA scientists were using a borehole camera to look back up towards the ice surface when they spotted this pinkish-orange creature swimming beneath the ice. And they believe the probability that these two animals swim into the hole of six inches in diameter, about 20 kilometers away from open water, is 'almost zero'. If higher-forms of life are able to survive underneath the hostile environment of Antarctic ice, the discovery by the NASA team furthers the debate as to how easily it will be to find extraterrestrial creates in the solar system. Does Antarctic shrimp mean extraterrestrial life? Scientists are gaining new insight into the mechanisms involved in the generation of huge steep underwater waves that occur between layers of warm and cold water in coastal regions of the world's oceans. Researchers at the University of Rhode Island said they discovered large amplitude, non-linear internal waves can reach heights of 490 feet (160 m) or more in the South China Sea, and the effects the waves have on surface wave fields ensure that they are readily observable from space. Fragmented garbage, trapped by the currents are concentrated in a vast area in the Sargasso Sea. The impacts are unknown, but we know that many animals suffer of this situation. For twenty-two years, researchers and students in oceanography of the American Association Sea Education went to draw their fine mesh nets - more than 6 000 times - in the waters of the Atlantic between Nova Scotia (Canada ) and the Caribbean. They were counting the different species, but also waste. In late February, at a conference in Portland (Oregon), they drew a not very appetizing statement in this unprecedented campaign. Since 1997, we knew the existence of a large garbage dump in the Pacific, "a continent of plastic" had imaged the sailors fell over. Sea Education has found a comparable concentration in the Atlantic, about 1 000 km from U.S. shores, in the Sargasso Sea. An area larger than France, where light plastic waste is concentrated of 200,000 fragments per square kilometer and with a depth of ten meters. As the circling currents and winds are low, this "plastic soup" does not disperse. The wastes stay there, derived for many consumer products, most big like confetti. One hundred million tonnes of plastics are produced each year worldwide, Greenpeace said a tenth ends in the ocean. From this mass, 20% comes from ships and offshore platforms and 80% from land. The sustainable qualities that make the success of plastic objects become a major problem once they are in the sea. They last. But not in the form of bottles, boxes, bags or cans. Under the action of the sun, waves, abrasion, they crumble into ever smaller pieces. "The impacts on the marine environment remain unknown, observes Kara Lavender Law, an oceanographer from Sea Education. But we know that many marine animals eat the plastic and that has a negative effect on birds in particular. " The next expedition, in June, will pursue the issue. In 2008, oceanographer Charles Moore has published a study estimating the number to 267 species of animals - mammals, fish, birds, turtles - affected by waste plastics. Nearly half of the seabirds eat at one time or another by mistake. Sometimes they die, with an digestive tract obstruction. Humans could also suffer the consequences. The pieces of plastic, like sponges, concentrate pollutants which absorbed by fish, may well go back to our plates. During this time, David de Rothschild and his crew are running an eco-expedition in the Pacific ocean called Plastiki (from San Francisco to Sydney) on a catamaran made of newly developed plastic bottles which are easier to recycle. The COMET Program is pleased to announce the publication of 'Introduction to Hydrography'. This 1.5-hour module provides an introduction to the field of hydrography pertaining to nautical charting and navigation. 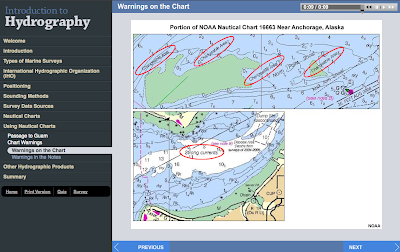 It covers how nautical charts are created, who creates them, the products available, and how to find and use them. The intended audience for Introduction to Hydrography is anyone who uses nautical charts including ships' navigators, Navy Aerographer's Mates, and the general boating public. The Hydroptère project is not limited to the performance of the 60-feet trimaran which has beaten two world speed records at an average speed of over 50 knots in 2009 in the Mediterranean. Today, l’Hydroptère is in a shipyard in Lorient (France) and she should be back in the water in spring. Alain Thébault (the only living Icarus among the oceanic skippers) and his team decided to extend the limits of the project and planned to develop two new boats, with the ultimate objective of sailing around the world in approximately 40 days on l’Hydroptère maxi. To reach this objective, the team with the assistance of some retired engineers (the 'papés') and of their scientific adviser (The Swiss Technological Institute in Lausanne), decided to follow the same experimental process as that employed by Alain Thébault in the development of l’Hydroptère and to consider an intermediate step, that being to build on a reduced scale a test model i.e. l’Hydroptère.ch. l’Hydroptère.ch will be used as a lab boat for testing geometries and behaviours in varied real conditions before starting the development of l’Hydroptère maxi. As a Swiss-French project l’Hydroptère.ch which should be launched beginning of summer 2010 is being built in two shipyards, one in Brittany and one in Switzerland. In the same time, some other hydrofoil flying boats are training in Dubaï with the need to burn themselves to every suns before the start of 2010 Puma Moth Worlds. English translation of Marie-Béatrice Baudet's original article, journal "Le Monde, March 12, 2010"
It's the story of a young naval lieutenant, François-Edmond Pâris, raised in the severity of the Naval School, brilliant teenager, gifted in math, but who did not like card games or the atmosphere of intoxicated taverns. During stopovers, he preferred to peacefully engage in his lifelong passion: drawing, a talent inherited from his mother, a daughter of a Brest shipowner, who was a little artist. His sailor's eye did the rest. He decided to capture the vessels which he found in his travels at sea, intrigued by their shape, their material and their use. His brushwork made miracles and at final a real scientific work. Since March 10 (until 19 September), the National Museum of the Marine in Paris, pays tribute to this gentleman of the nineteenth century with an exhibition entitled 'All ships in the world'. A collection of beautiful drawings, sketches, models, watercolors he took two years to compile, explains Alain Niderlinder, assistant curator at the Museum of the Marine. This heritage treasure made of Admiral Pâris, born in 1806 and died in 1893, the founder of nautical ethnography. The book he published in 1843, Essay on the shipbuilding nations outside Europe, remains a bible for scientists who claim to be heirs of his school today. "Pâris would have been content to describe the crafts from Arabia , India, China, Polynesia, for simple technical drawings, explains Eric Rieth, director of research at CNRS and member of scientific committee of the exhibition, but he quickly sees that the boat is also a social object, in harmony with its natural environment, economy and culture. In short, the boat is also and especially men." Fortunately, the military who required to speak in English at home so that his two son, sailors also open onto the other, writing. He annotates his drawings, describes, analyzes, compares... "This is a field researcher, in line with social anthropology," says Rieth. For him, the boats outside Europe, those of 'wild' or 'natural' people, according to the vocabulary of the nineteenth century, are likely to be subjects of history as well as civilian buildings, military and especially religious. When he boarded the Astrolabe as Hydrographer in 1826 for his first circumnavigation of three years - it will make two more trips around the world -, the young naval officer was noticed by his commander, Dumont d'Urville, who encouraged him drawing. The mission is still in the spirit of exploration of the eighteenth century, although it is also going to shake the French flag along the coasts of Africa and Asia. It was during this expedition that the scientific project of Pâris began to take shape. Ethnocentrism repels him. This humanist feels the need to clarify and convey : "Our era of progress may be accused later of being selfish and letting lose what does not serve his pleasures or his direct utility", wrote there. Some criticize him for not being able to completely detach from the thought - and also from the conquests - during the colonial era, giving way for Africans he didn't like, to stereotypes of racial anthropology. But his empathy for the other indigenous people was real. One event was particularly marking for him. 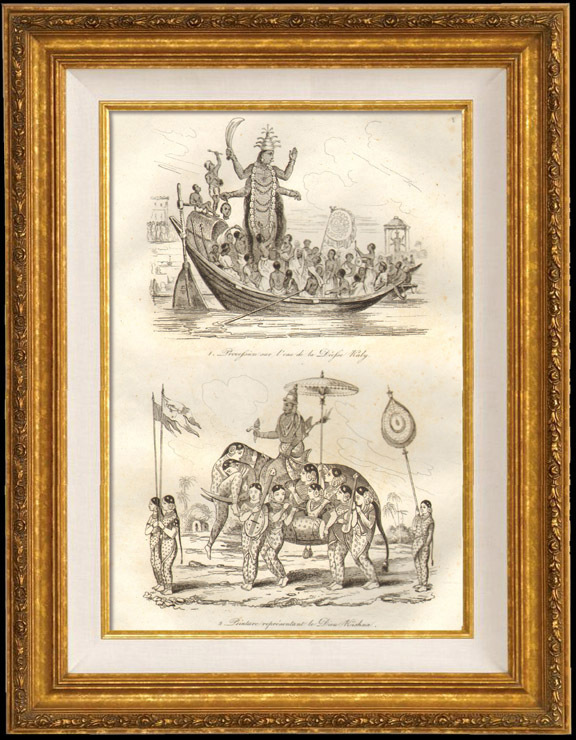 Fan of James Cook, the famous British explorer of the eighteenth century, he devoured his travel stories in Polynesia and his descriptions of Tahitian leaders'canoes, including the King O-Too, architecturally very sophisticated for the period. A ship of war completely sewn by hand, over 30 meters long, powered by 144 paddlers. When he landed in Papeete in 1839, during his third world tour aboard the Artemise, a frigate commanded by Laplace, it found no trace. Many villages are deserted, the warehouses are empty ... "The boat was exceptional," says Hélène Guiot, ethno-archaeologist attached to the joint research unit (UMR) and Archaeological Study of Antiquity (ArScAn) . But like many others, its destruction was ordered by the Catholic and Protestant missionaries, obsessed with the eradication of objects associated with pagan rituals. The idols should be burned. " The scientist tells about offerings dedicated to all the tutelary gods, protectors of the boat. The spirits of shipwrights, for example, to thank the choice of wood, flexible ties, dense stem. It describes how the deportations and travel bans - to better monitor populations to convert - have led to the loss of knowledge of the sky and its stars, so ultimately navigation. During the Polynesian stopover, Pâris understands, in the words of Titouan Lamazou (*another modern navigator also involved in painting, traveling and ethnography) who prefaced the book devoted to the exhibition ('All ships in the world', published by Chasse-marée-Glénat) that "fears about the casualness of our civilization of progress are well founded". Upon his return to France, he continued writing his essay. It does so with more alacrity so the staff of the Navy, also impressed by the excellence of its engineering background, entrusts him the task of developing the steam propulsion, which earned him the "Admiral of mechanics" nickname. The world of sailing is definitely threatened. The Clippers will soon give way to the freighter. When he left active duty in 1871 to become curator of the Naval Museum of the Louvre, he puts the finishing touches to his work. And he builds from his observations, dozens of models, from the Arab dhow to Pondicherry chelingue. The memory of the sea is preserved.